Normally only available in the Pacific Northwest, the Douglas Fir tree is legendary in its heating characteristics. 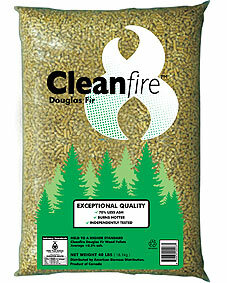 Our Cleanfire Douglas Fir wood pellets are made from 100% Douglas Fir – so the pellet is made only from the good stuff! These pellets are a distinctive reddish-brown color. We source them from the western forests of British Columbia, and include material recycled from standing deadwood – very environmentally friendly! To ensure we’re delivering the highest quality product possible, we lovingly transport the pellets from British Columbia, screen out all the fines and then bag them here in New England.